Schemes fall into two broad categories. The first is where the new equipment is relatively lightweight and can be added without the need for any roof strengthening works. The second is for heavier equipment where roof strengthening works are required. For both categories, the starting point is to establish the strength, existing loading arrangements and condition of the existing roof structure to determine whether there is any spare ‘load capacity’ available. 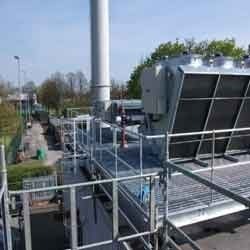 Mechanical plant, eg heating and ventilation systems. Novatech Projects (India) Pvt. Ltd. formerly known as Novatech Process Equipments (P) Ltd. was established on 21st August 1984 by farsighted visionary Mr. Sukumar Ghosh a graduate from Kolkata University.The company started primarily as a Process Equipment Manufacturer for the growing requirements of Chemicals, Paints, Pharma and other Allied Industries in the Indian Market. With a modest beginning and steady growth Novatech has been an established player in process equipments manufactur-ing by mid 90's. Soumadeep Ghosh son of Sukumar Ghosh after completing his engineering, joined the company in 2003 and then started dreaming to make it big in the already growing core sector businesses in the country. His hands became more stronger when his brother Rajdeep Ghosh joined in the year 2006 and they are now actively taking the company forward to achieve the dreams of their father Mr. Sukumar Ghosh. Novatech Group is a 100% family owned business which has its plans of going for a public issue in the next two years time.